1.1 "Exhibition Administrators" means the FBA or (if the context so requires) the constituent organization managing a particular exhibition. 1.2 "FBA" means the Federation of British Artists Ltd.
1.4 "Works" means all artistic works, and other related works, created and developed by non-member artists. 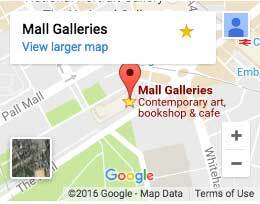 2.1 These conditions apply to the submission and exhibition of Works managed by the Exhibition Administrators, including FBA exhibitions at the Mall Galleries. 2.2 Further specific regulations and fees for each exhibition are specified on the FBA Website. 3.1 The size of Works to be provided is the exterior frame size, or in the case of sculpture, the longest measurement. 4.1 All Works must be exhibition-ready. Works should be sufficient to withstand mirror plating for hanging purposes. 4.2 No hooks are required and there should be no projections whatsoever from the back of the works. This is to prevent damage to other works. 4.3 Metal frames and clip frames are inadmissible. Glazed Works with unprotected glass edges are inadmissible. Diffused picture glass is unacceptable. Frames and mounts of an unusual colour, size or design may prejudice the chance of selection. 5.1 Works should be delivered unwrapped with forms and labels. Please complete all labels carefully and attach to the Works. In particular, please attach labels to the back of picture frames and to the bottom of sculptures. The exhibition catalogue is compiled from the information on the form you provide when you submit so please complete it accurately. 6.1 Our open submission exhibitions are open to artists in the UK, EU, and outside the EU (Please note: Artists outside the UK and EU may not submit to The Columbia Threadneedle Prize). 6.2 There is a non-refundable submission fee for all exhibitions unless stated to the contrary. Artists aged 35 or under at the time of the submission of their Works to the Federation of British Artists are entitled to a reduced fee. 7.1 The FBA will publish a list of the registration numbers of all accepted Works on the FBA Website no later than 3 days after selection. 8.1 Dates for collection of Works will be published on the FBA Website. These are the ONLY days that Works can be collected from the FBA's offices at 17 Carlton House Terrace. Please ensure that arrangements are made for your Works to be collected on the days specified. Please note that we cannot wrap Works for collection. 8.2 Any uncollected Works will be removed from the FBA's offices after the collection days and stored by an independent courier company at the artist's expense. 8.3 The Exhibition Administrators can give no information or warranty as to storage charges made by any other company. 8.4 If the Works are not collected or claimed by, or on behalf of, the relevant artist within 12 months of the last collection day (notified under clause 8.1 above), the FBA will be entitled to destroy, sell, or otherwise dispose of the Works without consent and without prior notification to the artist. The artist hereby agrees that it will not be entitled to any compensation as a result of the aforementioned destruction, sale or disposal of the Works by the FBA in accordance with this clause 8.4.
before, during, or as a result of an exhibition managed by the Exhibition Administrators. 9.2 Once work has been submitted to the FBA, any sale affected by the Exhibition Administrators before or during the course of the exhibition shall take precedence and supersede one made privately. Any private sale will incur the normal commission. 9.3 The price of Works stated must include the commission of 45% plus VAT. With the exception of works for which foundry fees are applicable, where the commission is 33.3%+VAT. If the artist of the Works is registered for VAT, then the VAT due on the selling price of the Works should be included in the price entered on the form. 9.4 The price for the Works provided is the catalogue selling price and is the price that the Works must be sold at. This price can only be changed by prior written agreement between the Exhibition Administrators and the artist of the relevant Works. The Exhibition Administrators reserve the right to query the price of Works. 10.1 The copyright and all other intellectual property rights in and to Works, will remain the property of the artist and any enquiries in relation to such rights will be referred to the artist. So far as any rights in the Works are owned by a third party that third party will remain the owner of such rights in and to the Works. 10.2 The Exhibition Administrators have the right to copy and/or reproduce the Works and to communicate and/or issue such copies to the public in connection with the exhibition, for advertising the sale of the Works, for educational and public workshops, and for general marketing or promotional purposes, and other related activities, including without limitation the incorporation of images of the Works within promotional and marketing materials, postcards, catalogues, posters, DVDs, on Exhibition Administrators' websites, in workshop presentations and on information screens throughout the exhibiting gallery and any media now known or hereafter devised. 11.1 The Exhibition Administrators and/or their agents undertake no responsibility whatsoever for any loss of, or any damage to, Works entrusted to them, whether arising from fire, default, error, neglect or theft by carriers, packers or other persons and whether in their own employment or not, or otherwise howsoever and all goods are at artist owner’s risk absolutely and the Exhibition Administrators and/or their agents exclude all liability to the maximum extent permitted by law. THE GALLERIES ARE USED FOR VARIOUS PURPOSES AND YOU ARE ADVISED TO INSURE YOUR WORKS AGAINST ALL RISKS. 11.2 The Exhibition Administrators will endeavour to take good care of Works sent for exhibition, but in the event of a Work sent for exhibition being lost, destroyed or damaged the Exhibition Administrators' liability (if any) shall not in any event exceed the value of the work as stated on the submission form (less 45% plus VAT) or any altered price subsequently notified to the Exhibition Administrators. 11.3 The Exhibition Administrators shall not be bound by the price stated on the submission form and in the event of any dispute arising as to the amount of any such loss or damage, whether or not liability is disputed, the dispute shall be referred for arbitration, independently of any issue as to liability, to an independent expert valuer to be chosen by agreement between the parties, provided always that the arbitrator’s award shall not exceed the Exhibition Administrators' maximum liability in accordance with sub-paragraph 11.2 hereof. The arbitrator’s award shall be final and shall be conclusive evidence of the amount of the loss. The artist shall not be entitled to begin or maintain any action at law in respect of their loss until the arbitrator shall have made a determination in accordance with the terms of this sub-paragraph and then only for the amount so awarded. 12.1 Artists submitting their Works to the Exhibition Administrators (whether such submission is for an exhibition or any other purpose) shall indemnify and keep indemnified the aforementioned parties (including their agents and affiliates) against any actions, claims, proceedings, losses, liabilities, charges, costs and expenses which they may incur arising out of or in connection with any actual or alleged financial or contractual arrangements between the artist and any agent (other than Exhibition Administrators) or any third party. 13.1 The Exhibition Administrators will hold the personal data supplied by the artist on the Mall Galleries submission form, in accordance with the Data Protection Act 1998. It will only be used for administering exhibitions, commissions and prizes and will not be transferred to a third party without the consent of the artist, subject to clause 13.2 below. 13.2 Unless expressly written to the contrary, the artist hereby consents to the Exhibition Administrators providing third parties with his or her contact details where such third parties might be interested in buying, commissioning or licensing the rights in and to, the Works. 14.1 The FBA reserves the right to disqualify any Work if the artist has failed to adhere to these Terms and Conditions and the relevant rules and by-laws of the FBA. THE SIGNING OF THE MALL GALLERIES SUBMISSION FORM IS TO BE TAKEN AS THE UNRESERVED AGREEMENT OF THE ENTIRE CONTENTS OF THESE TERMS AND CONDITIONS AND THOSE ON THE SUBMISSION FORM BY THE SIGNATORY.